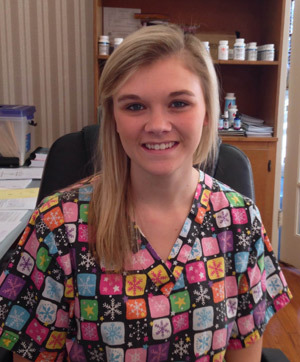 Casi is our Case Manager and the first smiling face you will see when you walk in the door of our Abbeville office. She takes care of everything from making your appointments to filing your insurance for you if you need help with that. Casi is dedicated to making sure that your experience here is a great one! Desarae is our Massage Therapist and is the newest member of our team. We get many rave reviews of her soothing massage work. Massage is a great way to ease stress and tension and work out those tired and sore muscles. Whether they are from heavy work or from carrying around a baby all day, Desarae can get those tight muscles to relax and give you some much needed relief. Massage works great in conjunction with chiropractic care but you certainly don’t have to be a chiropractic patient to come in and enjoy a relaxing massage. Our front desk does all her scheduling so give us a call when you get ready for your massage or when you need a special gift for someone else. Call our Abbeville office today to schedule your appointment!